In 1917, David Lloyd George declared that airmen were "the cavalry of the clouds . . . the knighthood of this war." This romantic image was fostered post-war by writers of adventure stories and the stunts of Hollywood filmmakers, and yet it was far from the harsh reality of life of an airman. From their baptism of fire in 1914 carrying out reconnaissance and experiencing the first dogfights, to the breakthrough in 1918 which claimed heavy casualties, the aerial defenders of Britain were continually tested. Here John Sweetman describes the development of British air power during World War I on the Western Front, which culminated in the creation of the first independent air force, the RAF. By making use of the correspondence of airmen and ground staff of all nationalities, he illustrates the impact this new type of conflict had on those involved and their families at home. 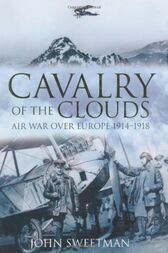 Extensively researched, Cavalry of the Clouds is an essential reference work for any student of military history. John Sweetman is the author of The Crimean War, The Dambusters, and Tannenberg 1914.